Two events are influencing me. One is the documentary movie “Love your Nature” which I encourage every one to see. This beautiful film demonstrates that creatures on earth are cooperating in a major effort to save the earth by connections, but not the human animal. This special animal ignorantly uses its intelligence in ways that will destroy the earth. They do not understand their connection to all things bright and beautiful. The other is the book Rewilding the Way by Todd Wynard who is charged by the Mountain States Mennonite Conference to define caring communities, watershed by watershed. My Joyce and I continue to read and think through Wynard’s book. After we read a chapter we almost always ask ourselves, What can we do? Not an easy question to answer for an 85 year woman and a 90 year old man. Most of life is behind us. Still the question burns, what can we do. Accepting “what is” does not mean that everything is going beautifully. Accepting implies that if I do not find everything in my world entirely as I like, I do not fret, complain or become resentful. Instead, love allows me to “work with others,” not to do the impossible, but to do what can be done. Here, I thought, is something for me to do that can be done. I can work with others to make Greencroft a safe environment for pollinators. So, you can see on the left what I posted on my door as an opening invitation. Today, the document on the right is posted on my door. 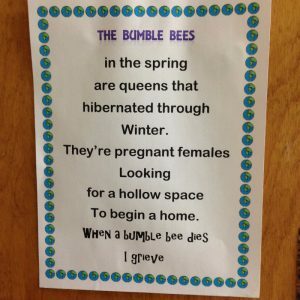 You may ask why I grieve when a bumble bee dies? I learned from the documentary “Love your Nature” that critters with tiner brains than I, do what they can to preserve the earth as their home and ours. 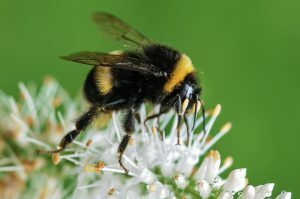 Why should I not grieve when a distant connection like a bumble bee dies at the hand of man? A bumble bee may be a considered a neighbor or a distant relative who relies on the good-will of the most intelligent beings on earth. yet do what they can. 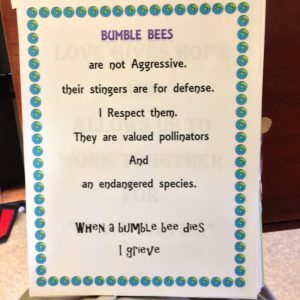 This entry was posted in Environmental Protection, Family, Nature, Uncategorized, Watershed Care and tagged Bumble Bees, good will. Bookmark the permalink. Very good, Martin! We have on our campus a 30 ft Avocado tree. Last year it was loaded with flowers. I expected bushels of avocados, but at the end of the season there were at the most about 40 avocados. I asked the owner of the tree what happened. He said he wasn’t sure but he thinks there were not enough bees to pollinate the flowers. This year again there are thousands , and thousands of blooms which are now over. Yesterday I could find only one small avocado beginning to form. Sometimes I think we are so concerned that everything be pristine and correct and forget about the birds and bees. Thank you for caring, and for caring for so many things, especially all creatures great and small.